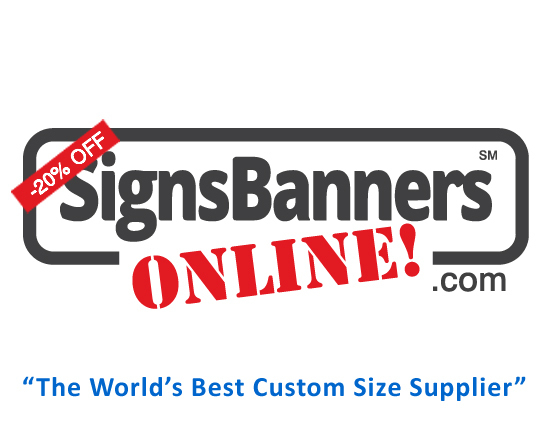 Signs Banners Online have a website you can input and download how to position & make your banners and printed displays for your banner sign printing company. IT'S FREE and is used by many sign companies and design agencies ( Now used over 12,798 times ) when they prepare their files. ADVANTAGE: USE FOR CUSTOM WORK. You can input any size. The template maker is easy to use and gives you the best specifications so you can quickly overlay your graphics. It's the best technique when your are preparing your designs for indoor our outside banner signs, flags, display trade show graphics and window posters. Within seconds it gives you custom specifications, plus an understanding of how a banner sign is made, the safety positioning of graphic elements and you can open it in your favorite graphic design programs. You'll be able to see where the edged get folded over, where the sewing positions are, where the fittings go and other stuff too. THAT'S IMPORTANT BECAUSE YOU WANT TO MAKE SURE THAT YOUR CREATIVE SAFELY FITS WITHIN THE MANUFACTURING AREAS. Their system is the best when you are starting to prepare your design positioning.